This morning I had to fit in a hive inspection, it is a routine weekly event during swarming season. I had to check through the frames and make sure there were no queen cells being built. It felt a little like a chore and I had to stop myself before I did it and remember that at every inspection at this time of year, I have to be ready to act if I find queen cells. It was just as well I prepared myself because the third frame I pulled was covered in swarm cells all charged with eggs and royal jelly. Unfortunately this is also the hive in which I have not marked the queen. I spent some time trying to find her until I committed to the decision of carrying on regardless. I set them to the side a little and set up an empty hive. Then I carried out a sort of shook swarm where I shook all the bees into the new hive. With a queen excluder over the shook swarm I placed all the frames and the old hive on top. With all the bees having been shaken off it was much easier to find all the queen cells and destroy them all but one. The frame on which I left a single queen cell was treated with care. I made sure I did not shake it; instead I brushed the bees off with my boar’s hair brush. I never thought I would ever need such a brush. The high rise system is to be left for another twenty four hours before splitting it up. 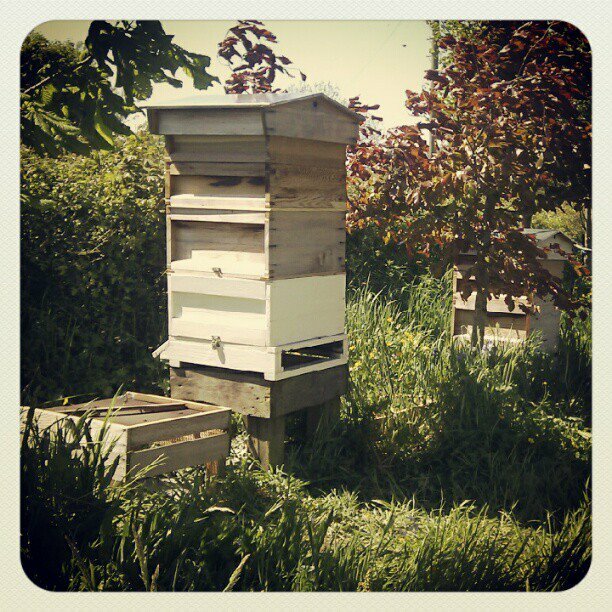 I think that I will now make it my life’s ambition to mark and clip the queen in this hive. If only to make it easier to find and cull her before heading into winter. Her daughters do not seem to produce as much honey as the other hive, and in her first year she should not have felt the urge to swarm. It seems cold and heartless but I am told that it is the accepted fashion to only keep a queen for a couple of years before buying in another from queen breeders. Whatever the outcome, it has left me a little anxious as the artificial swarm has used up all the spare equipment. If the other hive decides to do the same then I will have a serious problem. An order from a supplier is on the way but the delivery is an unknown. I chose to use a supplier who is a cottage industry. The craftsmanship is part art and the wood is sourced locally. I don’t regret this decision one bit, I regret not having the wit to put my order in earlier. The seasons have obviously shifted a gear with the coming of the blissfully warm weather. This evening I arrived home from work to find the three chicks lying in the shade and enjoying the fresh air after having been moved from the garage into the patio area. The two-week old chicks are still in the house and they seem to be developing very well. They have grown the beginnings of their wing feathers which seem quite white already. Deep inside me there is a suspicion that the eggs we bought as light Sussex are in fact coronation Sussex, and the eggs we bought as coronation Sussex are in fact light Sussex. It is not very likely that the lady who sold them made this kind of mistake, but the chicks which should be dark are light and the chicks that should be light are dark. The older hens also seem to be enjoying the sunshine and warmth. For a few minutes, every day of so I like to stop and watch them to see what they are up to and to see if they are happy. They had dug themselves a new dirt bath during the day and they had taken plenty of their water; a good thing in this weather. One of the hens came a little closer as I watched and I ran my eye over her and found something upsetting. Chickens are very susceptible to respiratory infections and they can be fatal. One of the symptoms is what confronted me; blood around the nostrils. My heart deflated a little inside. Then I looked at her again, her posture and stance was not that of a poorly bird, it was the stance and walk of a healthy and alert bird……..the penny is in the air……. I looked to the next bird to again see a little blood around the nostrils and unexpectedly, a little blood on the beak…..the penny is falling…..I am certain that if anyone had been watching me they probably would have seen me frown and hold a ‘hold on a minute’ expression as I looked to the third bird in my line of sight. The third bird had lots of blood on its beak and …….the penny has landed…. No blood around its nostrils. I leapt into action and ran to the shed. I flung the door open to see a forth hen with blood all over her beak and her head sunk down and eating something in the corner. I couldn’t see into the corner from where I was but I suspected the worst; the fifth hen. I ran around to the other side of the shed to the door near the corner. I shouted at the forth hen but she ignored me and I had to sweep her away. I expected the horrific scene of a dead bird but I found something even worse. The chicken was alive and standing with a substantial part of her insides on the outside. She looked at me as I swept the other hen out of the way and if she could speak with her eyes I am certain she was asking, “why are they doing this to me?” I closed up the shed and tried to calm down a little and rationalise the situation. At this point I must have shouted a bit as the lovely Sharon and the little man arrived on the scene to see what all the fuss was about. The little man began to get distressed at the situation. Not fully understanding he picked up on my emotions and the lovely Sharon’s as she began to realise what had happened. For some time now one of the hens has not been laying. Ever since her moult in the very early part of spring, she has not been able to lay regularly. Once in a while she has produced a shell-less egg. Once in a while she has also laid an egg with an irregular shell, but she hasn’t laid ‘right’ for a couple of months. It is my suspicion that she forced out her bowels while trying to lay an egg and then her sisters turned on her when they spotted the chink in her biological armour. I had very little choice in the matter, the ending to the situation had only one conclusion in both our minds. The lovely Sharon distracted the little man with a watering can and a lesson in watering the plants. I took the weakly bird in my arms and took her away from the others. I ended it. Tonight was supposed to be all about having a glass of home-made ale in the sunshine, It was supposed to be about watching the hive entrances as the bees foraged in the heavy scented air. It was supposed to be about watching the hens roll about in dry dust baths in the long shadows. Instead it turned out to be about the darker and more unpleasant side of animal husbandry. The darker side of life that sometimes crops up on the brightest of days. I love tomato bread but could never seem to find some being sold anywhere. So I decided to try and make my own. After lots of experimentation I have settled into something that seems to work for me. 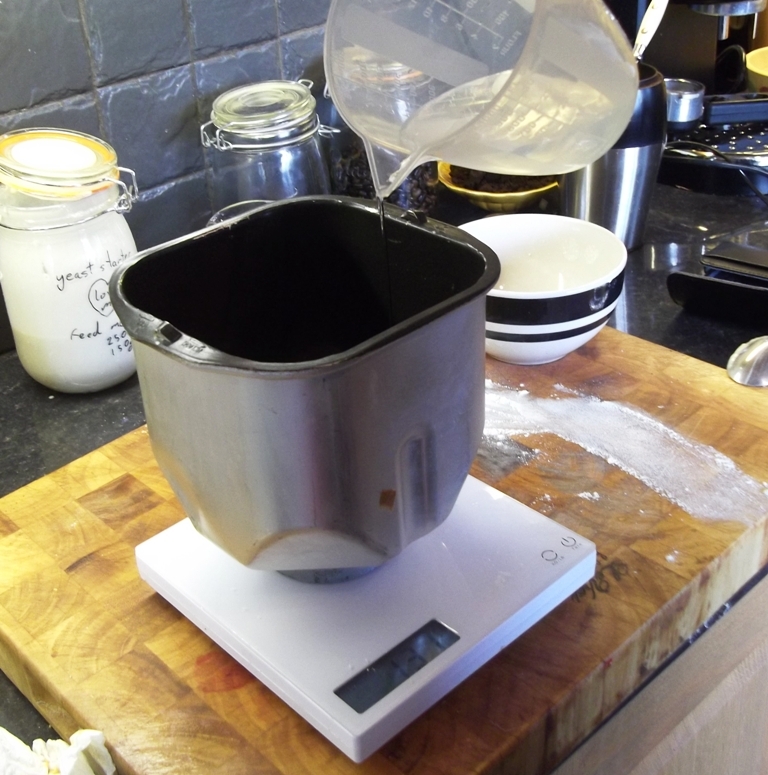 I start with ten grams of salt and two hundred and seventy millilitres of water. I actually use two hundred and seventy grams of water as the density of water is… never mind. Then I add five hundred grams of strong white bread flour, or very strong white bread flour. I find that Canadian flour is the best and it really does make a difference. I have been told that the Canadian flour is healthier too as it has more selenium. 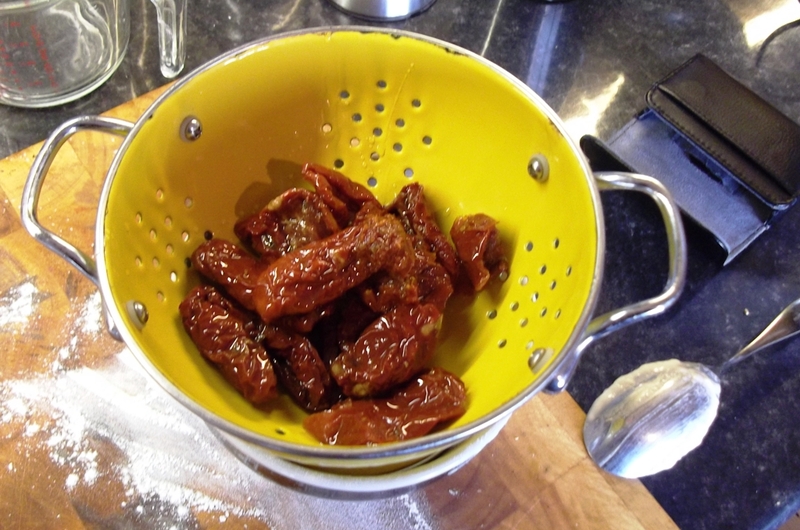 Then I chop up about two hundred grams of sun dried tomatoes. I use the ones in jars of oil. I drain them a little but let some of the oil stay on them. 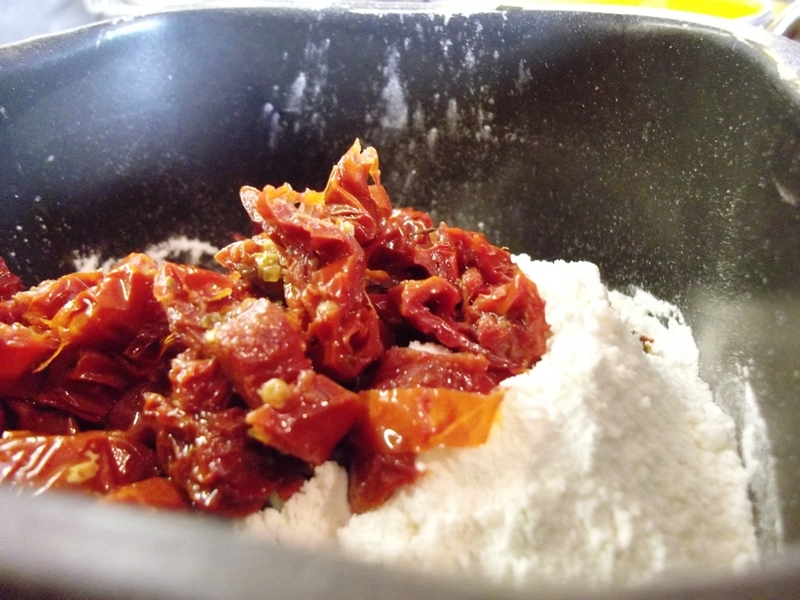 I have used the sun dried tomatoes from a deli a few times, but found that I had to dip them in oil as they were too dry and the oil add flavour and liquid to the bread mix. 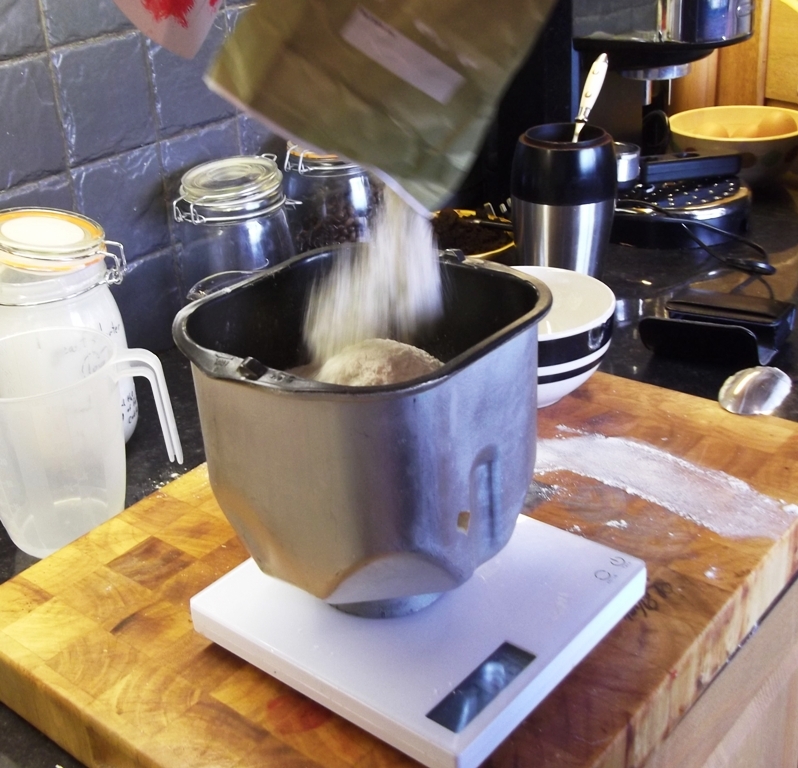 Then I add ten grams of dried yeast before I put it all in the bread mixer set to a standard bread mix setting. The bread mixer seems to be able to knead it better than I can by hand. It takes an hour and a half to finish its cycle. I leave it in the mixer for another half hour or so before knocking the air out of it and shaping it into two loafs. At this point I turn our oven up to max; eleven on the Marshal scale. 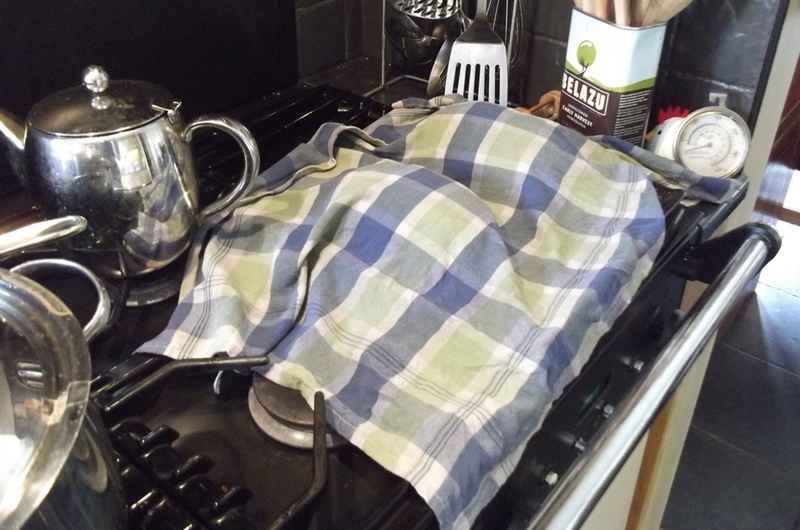 While the temperature is rising to ridiculous levels I cover the bread with a damp cloth and leave it for another half hour or so. Then the kettle is boiled and when it is ready I put the bread in the oven then pour the boiling water into a pre heated bowl in the oven. Of course the bread maker can bake the bread but I find that it dose not taste as good. 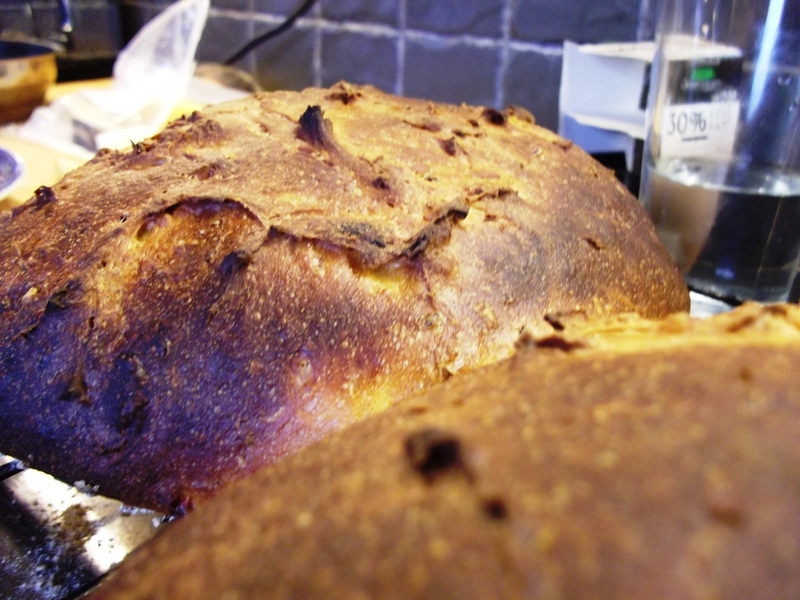 A good oven that can get to very high temperatures makes the bread taste better by far. The process can be helped by using an oven stone. They can be purchased for about twenty pounds. Alternatively, I used a ninety pence flag stone that I cut down to size with an angle grinder. It has roughly the same specific heat capacity as … never mind. 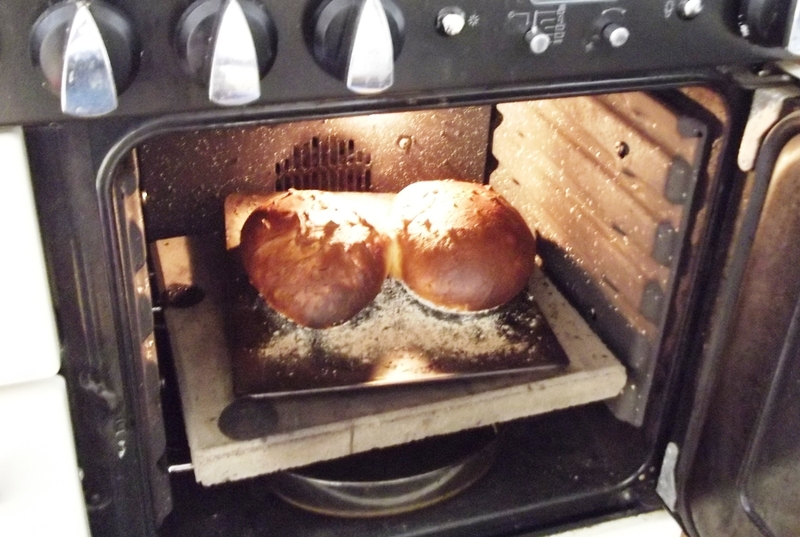 For our oven, eighteen minutes is usually enough to produce some nice bread. I call it disappearing tomato bread because that’s what it usually does. Today I made two loaves and tonight they are both gone without me even getting a chance to taste them! I’m thinking about time again. It all started a week ago when I did something that I felt loathed to do; I signed up to a gym. I believe that exercise should not be an exercise; it should be a part of our natural interaction with the world. A gym is the reverse of this; it is isolation away from the world. There is no bird song to be heard on a running machine. That said I have failed to fit proper exercise into my life since the little man arrived and it has been a hard fact to face up to. So, the gym is part of my time now as it can be slotted in and allocated its portion of me. I got hold of a copy of Earthlines and I was reminded of Jay Griffiths. I was reminded of her book; Pip Pip, a sideways look at time. This has prompted me to think about our interaction with time again. This morning I slowed myself down to bee time. The bees actually operate at a faster level to us but they are sensitive to our normal speed of motion. I moved slowly during the inspection in order to convince them that I mean no harm. My motions were smooth and sluggish. I removed the frames at a bee’s walking pace and I relaxed into a persona of calm without fear. To be honest, the sun was shinning and the air was warm, this meant the bees were quite calm and relaxed. In the second hive I spotted two play cups which had eggs in. Play cups are a normal part of the hive, they are the beginnings of queen cells which are part of the preparation to swarm. Play cups themselves are not a sign that a swarm is imminent, but eggs in two play cups are a hint in that direction. They are a sign that I must make preparations for swarming and the possibility of tricking them with an artificial swarm. This means that weekly inspections are part of the flow and pattern of chores here at the cottage. The chores have been increased too. Where we had a few hens to look after we now have a few hens, a few older chicks in a coup in the garage and a lot of new fluffy chicks in the brooder in the utility room. The cats have slipped down on the list recently. In my mind I have made their welfare a priority in terms of their food, water and accommodation, but I have let their affections slip away from me. I have been so busy that I can’t remember when was the last time I sat down with one of the cats and scratched them under the chin or gave them any kind of attention. So it pleased me tonight when I scratched under Tillie’s chin. She just appeared serendipitously as the little man and I finished earthling up the potatoes. To be honest I did most of the earthing up as the little man sat and watched while occasionally thrusting his had into the dirt and muttering something that must seem comprehensible to him. Tillie approached and I scratched her under the chin as the little man sat down on my knee and looked at the sunset. Tillie was the first ever animal that the lovely Sharon and I took into our care. 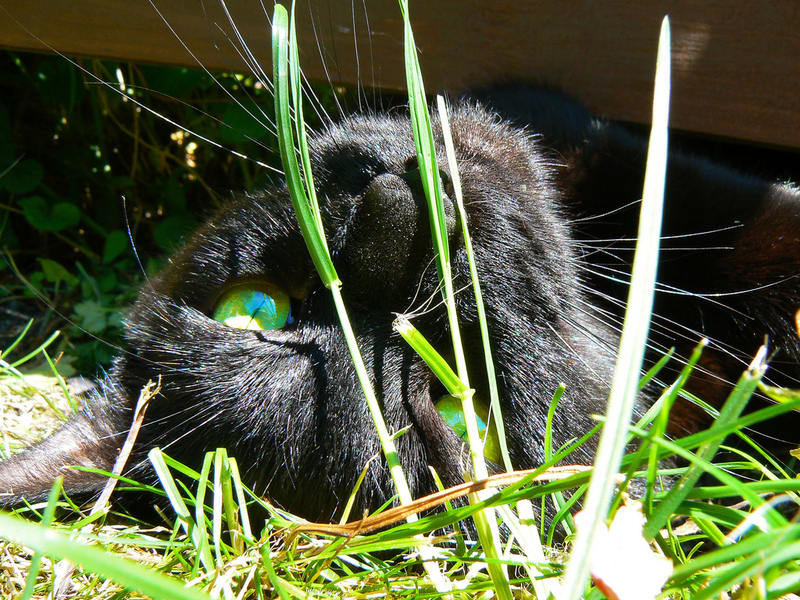 She was thrust upon us unexpectedly and we loved the challenge of looking after, and loving, an animal. As I scratched her under the chin I thought about how many animals we are caring for now. The little man is learning to say some words. So far he says, maa-me, da-dee, byeee, and all-gone. He also uses baa quite a lot. These few words are mixed into his own unique language that he has been developing. When he gets out of the car after a hard day at crèche he says, “wadawee a yawee a yawee”. He says this while holding out his arm and hand with a little grabbing action. This all translates to, “take me to see the sheep”. We take him the sheep without delay, for fear of his anger. Then we look out over the fields and he looks around at the empty fields and he says “baa”. Then he turns up both his hands empty and says “all gone”, accompanied by the upturned lip of a sad face. Today one of the fields held the surprise of being full of baas, little jumping baby baas and big woolly mummy baas. He simply stood in silence for a few moments and took it all in before shouting baa repeatedly. It is now the custom to run to the utility room after inspecting the baas. Again he demands, “wadawee a yawee a yawee”. And we oblige by holding him up to see the box full of chicks. Recently there has been a flurry of panic as one or two of them try to escape when we lift the lid. He seems to disapprove of this. This evening we went out for an adventure. 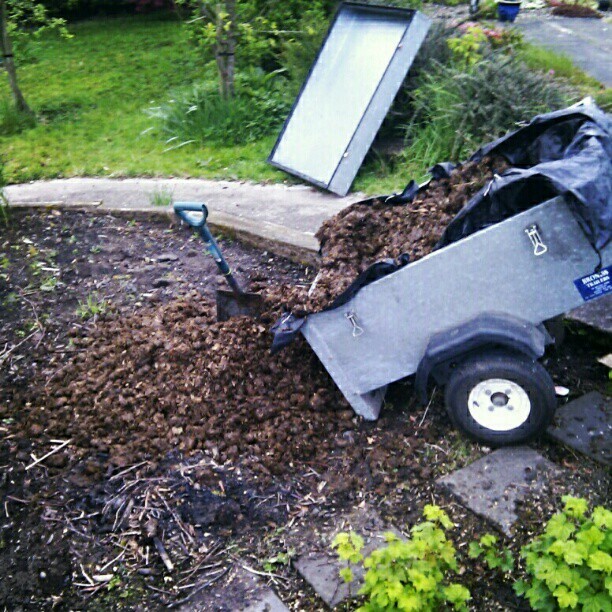 We headed to the other side of the village to pick up some horse manure for our vegetable patch. It’s a job we have put off for too long and as a result we are very late at getting some of the seeds in. When I say it was an adventure it actually involved me standing and shovelling in a steaming, wormy pile of poo complete with big mushrooms growing all over it. I did this while the lovely Sharon and the little man looked at the bulls, the horses and the cats, all of which are apparently called “baa”. After all this, and the prospect of five chicks to hatch this weekend, the lovely Sharon is pondering the possibility of going on a day trip to an open farm. We would apparently pay good money to see all the animals because we believe that it is the thing to do. About a week ago I looked at the calendar and realised that I would be at the cottage in the Mournes close to the full moon. Such a syzygy between the moon, the cottage and me is usually deliberate, but this time it was purely coincidence. At lunch time on Friday I tried to herd the pupils into the minibus to head to the mountains. There are usually a few pupils who are the sort that are busy. The sort that are quite well organised but seem constantly preoccupied because they are doing so much, doing so many worthy things. There are usually one or to of these types, but somehow most of the pupils were like this. They all seemed to have meetings to attend and I found myself having to be patient and wait on them without being able to be justifiably angry with them. Eventually we piled into the bus and headed for the mountains. 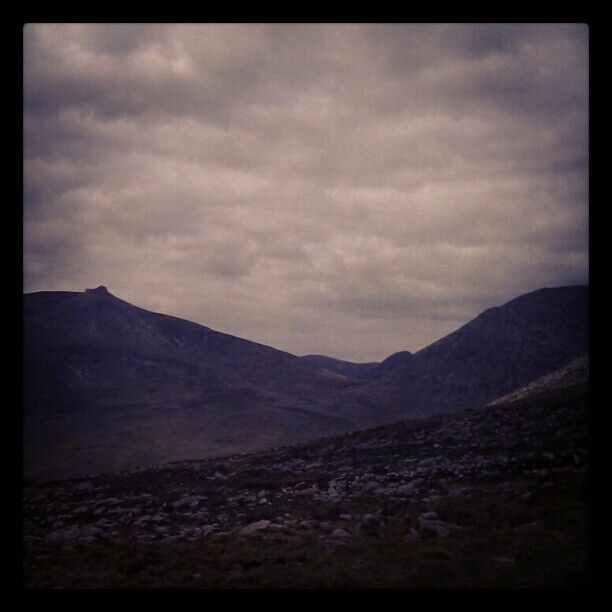 A few hours later they unfolded from the cramped minibus and loaded themselves with their backpacks before heading up into the heart of the Mourne Mountains. Their task was to arrive at the cottage before dark and they achieved it with time to spare. The evening was spent sitting around the old cottage fire and route planning by candle light before trying to get some sleep before the cold night set in. For a couple of brief moments between laughter around the fire I spotted the nearly full moon through the cottage window. We tried to read a few ghost stories but we totally failed to take ourselves seriously and stories were started but quickly ended in laughter. Saturday found us all awake very early. At half eight we had our feet on the hills and heading up into the Annalong Valley. Our route stretched the legs and gave the students a chance to remind themselves what hiking and camping involved, a change to enjoy the wild country and the air.